The early years of Orange County Teen Challenge consisted of various homes, offices, and coffee shops. A handful of men and women were committed to bringing freedom to those caught in addiction and prevent many others from ever having to experience the destructiveness of drugs, alcohol and gang violence. In 1966, a few Christian men rented a two-story home in Garden Grove where they began outreach and evangelism during the Jesus movement. In 1967, they opened a coffee house in Huntington Beach called the “Gospel Light Club,” where kids would come by the thousands to experience “Jesus, the Ultimate Eternal Trip,” which was painted on the wall. While hippies had their “Love-Ins,” Teen Challenge had “Praise-Ins” in local parks where they would host live music and evangelism. There were several homes throughout Orange County that were equipped to house the addicts who responded to the altar calls. To help prevent kids from having to suffer through drug addiction, anti-gang and drug rallies were conducted in junior highs and high schools all over Orange County. Hundreds of thousands of youth heard the message of Teen Challenge in the late 1960s. In the 1970s, Orange County Teen Challenge headquarters was located in the Orange Circle in Orange and drug education in schools, youth rallies, and community outreach continued to be at the forefront of the ministry. It also expanded to include outreach in local jails, which led to Orange County Teen Challenge receiving Disney’s top award for community outreach. There was also a 24-hour help line and a radio program called “Rap Line,” which once prevented three teens from committing suicide in one night. In the 1980s, Teen Challenge purchased a facility on Main St. in Santa Ana. A “Teen Academy” was opened that provided education, Bible studies, counseling and training to help families with teens overcome addictions. In the 1990s, a residential home for men was opened. It started out with 4 staff and 10 beds for a 3-month induction program. Though the Teen Academy had closed, youth ministry and outreach continued to be the main focus with the “His Kids” group already going strong. The small house on Main St. turned into a lighthouse for the surrounding community. The adult induction program grew into a 20-bed facility. “God’s Gang” was added in 1992 to provide a place for violent and at-risk youth to learn about Jesus. A computer lab and learning center was opened for kids to study and receive tutoring after school. Youth outreach spread to San Juan Capistrano and a satellite center for tutoring, youth groups, and neighborhood evangelism was opened there in 2002. Today, groups of at-risk kids are taken (most for the first time) to winter camps, sports events, and theme parks to develop lasting relationships and provide alternatives to gangs and drugs. In 2006, Orange County Teen Challenge acquired a 4,000-square-foot building, which was renovated to facilitate the rapidly growing youth programs. The new building facilitates parenting classes for families with at-risk youth and pregnant teens, English as a Second Language classes, and support groups. The house behind it was also purchased and is now used to house graduates in the “Mentoring Program” who are in transition from dependents of Teen Challenge to productive members of society. Evangelism and outreach to at-risk youth and families has always been at the heart of the ministry in Orange County Teen Challenge. Tim Suk emigrated with his family from Seoul, Korea to the United States when he was seven years old. Growing up on the streets of Los Angeles, Tim became involved in gangs, drugs and crime at a young age, and spent years in and out of jail as an adult. Tim came to know the Lord and was born again in 1995 while an inmate of Orange County’s Theo Lacy Jail. The following year, he entered the doors of Teen Challenge, a Christ-centered ministry that addresses addiction and other life-controlling issues. After completing the year-long program, Tim attended and graduated from Teen Challenge Ministry Institute. 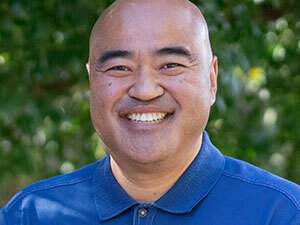 He spent the next 3 ½ years on staff at Teen Challenge in Hawaii. In 2002, Tim returned to Orange County Teen Challenge, where he has worked since. As Director of Orange County Teen Challenge, Tim oversees daily operations of the recovery home, a large neighborhood outreach and learning center, a transitional home for Teen Challenge graduates, and an adolescent home for boys. Tim is a ordained minister with the Assemblies of God. Orange County Teen Challenge reaches out into the surrounding communities, providing drug education and prevention, teen and gang intervention, clubs and a learning center for children, juvenile hall and jail ministry, crisis counseling, evangelism, and mentorship. Orange County Teen Challenge has two locations; headquarters in Santa Ana and an outreach center in San Juan Capistrano. The men’s home, afterschool learning center, re-entry home, and Timothy House Adolescent Boys Home are located in Santa Ana. The outreach center in San Juan Capistrano is modeled after the Santa Ana location and its outreach operations mirror the outreach programs that take place in Santa Ana. In 2009, two additional properties were purchased on Main and Sycamore streets to house Timothy House, Teen Challenge of Southern California’s first residential facility for adolescent boys, ages 12–17.